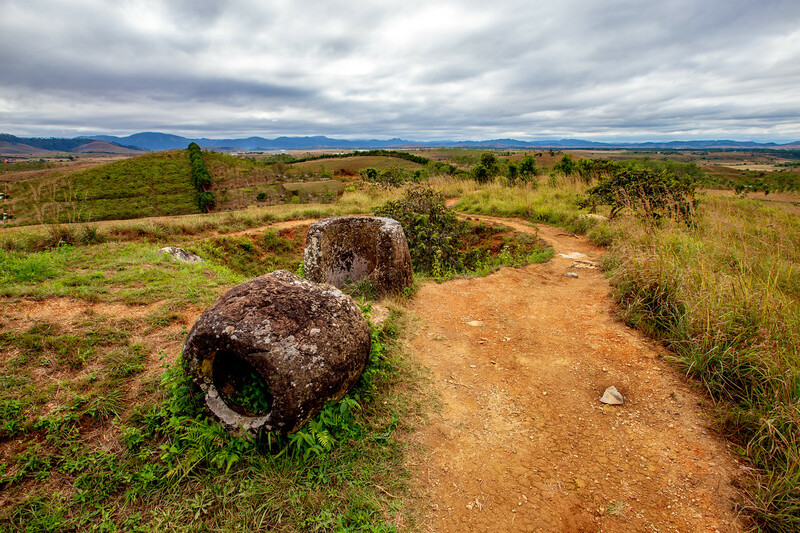 The Plain of Jars is located close to Phonsavan city in Xiangkhouang province in the northeast of Laos. They are a little bit out of the way of the normal tourist trail in Laos but they are well worth taking a side trip for and spending a few days in the area. 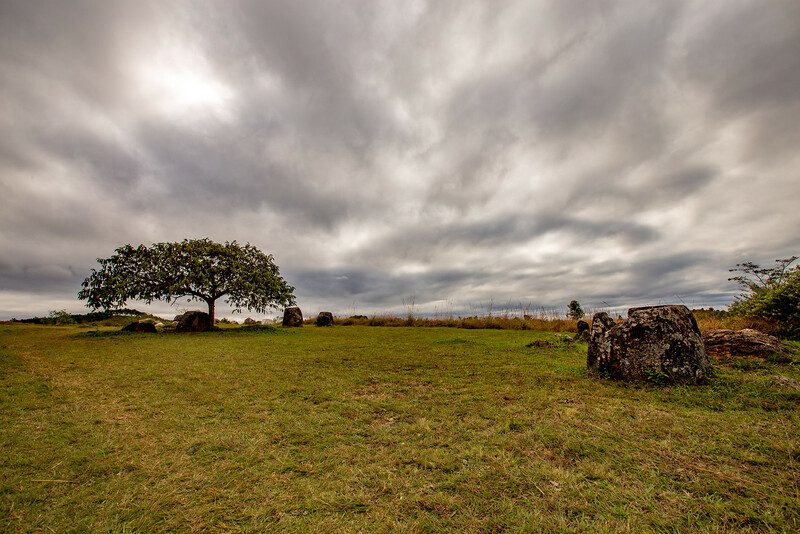 So What is the Plain of Jars? 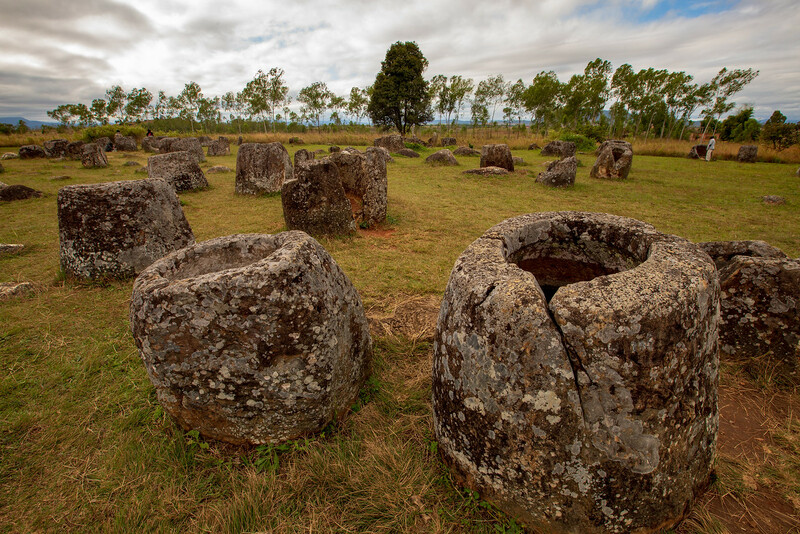 The Plain of Jars are a group of fields that contain giant stone jars cut out from sandstone rock, from around two thousand years ago. Some of the Jars are up to three metres high and weigh several tonnes. The story behind the stone jars still remains a mystery today. Archaeologists believe that the Jars date back to 500BC, the Iron Age. The most popular theory is that the jars were used in burial rituals. During the 1930’s, archaeologists discovered burnt bones and teeth inside the jars and believe the jars were originally sealed with lids. Today only one jar has a lid although there are a few stone lids between some of the jars. 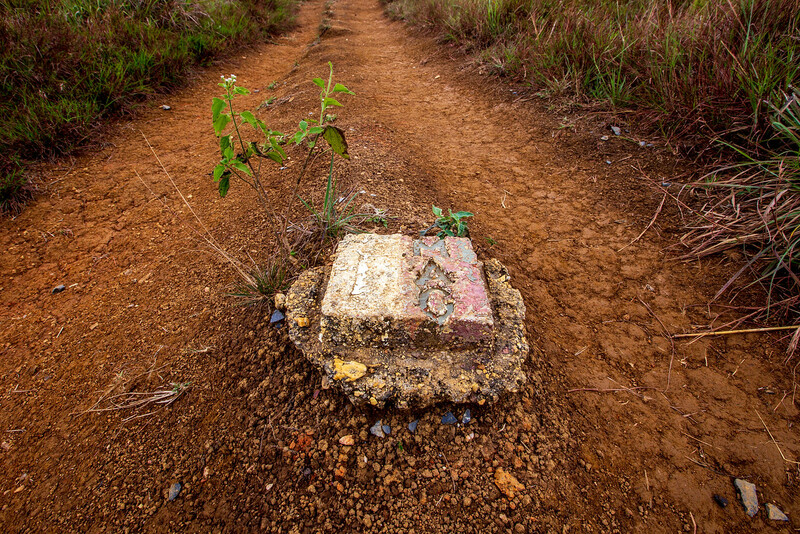 Some believe that the stone jars were to collect rainwater during Laos’ rainy season. Many locals will tell you that the jars were used for fermenting the potent lao lao rice wine. 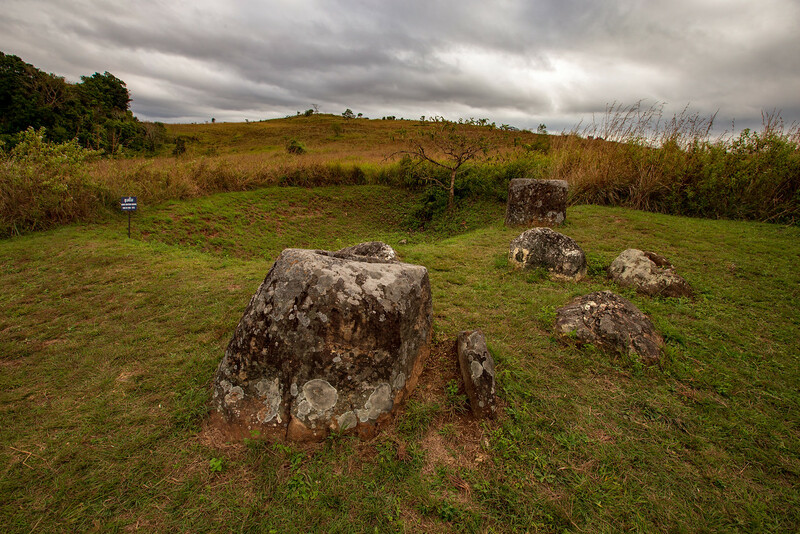 The closest site to Phonsavan to see the Plain of Jars is simply known as Site 1. It’s not far from the town and easy to reach independently although many guesthouses and travel agents in Phonsavan arrange tours to the sites. Site 1 is also one of the largest sites with more than 300 jars. From the entrance, a path leads up a small hill where the first jars were discovered. From here another path leads to the second group of jars where the only jar with a stone lid was found. There is also a cave at this site which archaeologists believe was used as a crematorium as human remains were discovered here during the ‘30s. It’s important to remember when exploring this region that this part of Laos was heavily bombed during ‘the Secret War’ so do stick to the recommended paths. The Mines Advisory Group (MAG) have done extensive clearing here but keep within the areas marked by white markers. 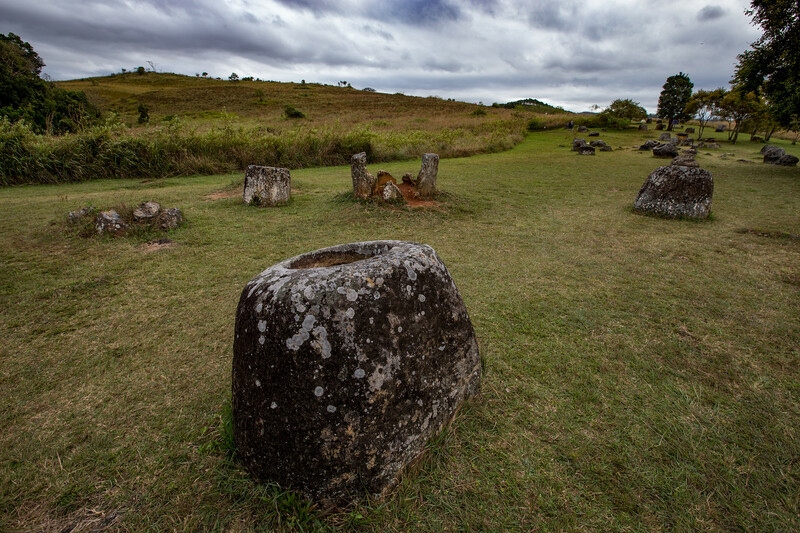 The easiest way is to see the Plain of Jars is to book a tour through your hotel or guesthouse. Most tours include about three sites, a Hmong Village, seeing bomb craters from the Secret War, and a burnt-out Russian tank! If you just want to see the main site, it’s easy to get there by bicycle, rent a motorbike or hire a tuk-tuk. The entrance fee is usually included in the price of your tour. If you are travelling independently, the cost is 15000 kip per person (around $2). What else is there to do in Phonsavan? Visit the MAG UXO visitor information centre located on the Main Street. Here you can learn more about the Secret War and how MAG have been clearing unexploded bombs in Laos. And pay a visit to the Quality of Life Association UXO Survivor Information Centre and Village Shop. Here you can learn more about UXO survivors and purchase goods that help support those that have been injured by bombs. Rent a motorcycle to explore the Plain of Jars and explore the area and local villages. 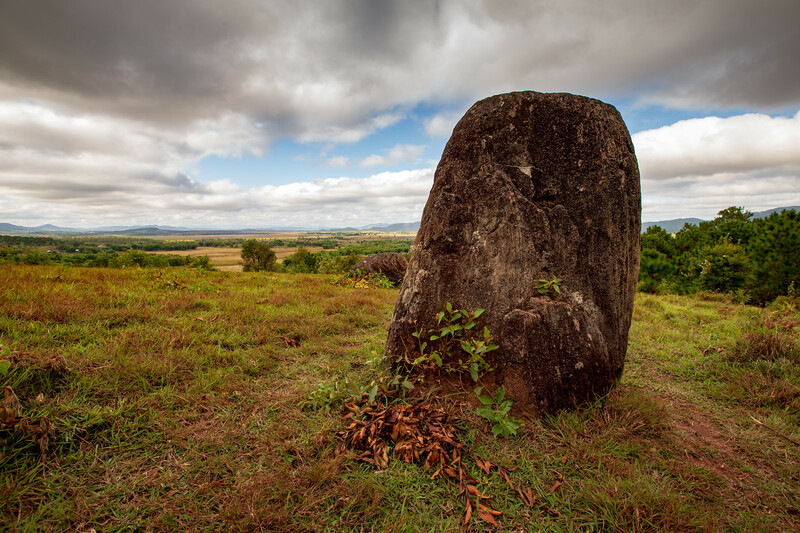 The easiest way is get to Phonsavan to see the Plain of Jars is to fly with Lao Airlines from Vientiane. Lao Airlines operate daily flights from Vientiane to Xiangkhouang Airport. Flight time takes around 30 minutes. A cheaper but a longer journey are the overnight sleeper buses from Vientiane which take about 10-12 hours depending on the driver! Minivans and buses also operate from Luang Prabang and take around 8 hours. Note that the journey from Luang Prabang is on very windy roads so prepare yourself if you travel from motion sickness. Ooh fabulous, I saw these strange stone “jars” on TV once but had forgotten what it was called and where to find it. I’m hoping to visit Laos in the next couple of years, so am bookmarking so I don’t forget this fascinating sight again! It’s an interesting place to explore. Well worth visiting for a few days! Ah man i wish i’d seen this.pist before we went to Laos We only got to spend 2 weeks there & we knew we’d missed some cool stuff but I’d never even heard of this. I reckon it would be worth the minibus ride on those winding Laotian roads! Yes, experiencing Lao roads is an adventure in itself. Two weeks is not long enough for Laos, we were there more than two years and that wasn’t enough lol. What an interesting place to visit! I’ve not yet been to Laos, and the Plain of Jars is so incredible. I can’t believe these stone formations date back to the Iron Age! That’s so impressive. I’ve heard of this place! So crazy to speculate on what the jars were actually used for…whether burial, water collection, or women accessory-holders, or whatever! How thrilling was it to walk in an area where there was a possibility of unexploded bombs, just below the surface? I might have to make a trip to see these next year when I’m in SEA! What a fun place to visit- I had never heard of this and Laos is on my bucket list! My husband would love to history aspect of this place. If only those jars could talk- the stories they could tell! From burials to bombs… so fun! I’d never heard of the Plain of Jars. Laos is such a mystery! I can’t believe that these beautiful artifacts have made it through so many difficulties. And thank you for the recommendations on how to get there. So inexpensive too! I never heard of Plain of Jars and it sounds interesting to know about them more. Visiting a place with ruins dating back to 500 B.C. must be great as it must be having so many beliefs and stories associated with it. I want to know more about Secret war. 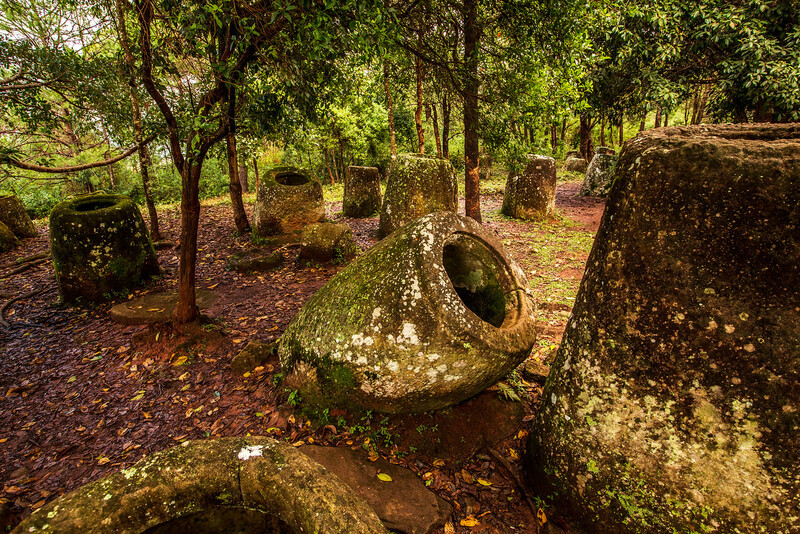 I’ve never heard of the Plain of Jars before, but they look fascinating. It’s always interesting to go to an archeological site like this where we don’t really know why these items end up here. Maybe it’ll always be a mystery, but it looks like they worth visit in person. Such an interesting place to visit! 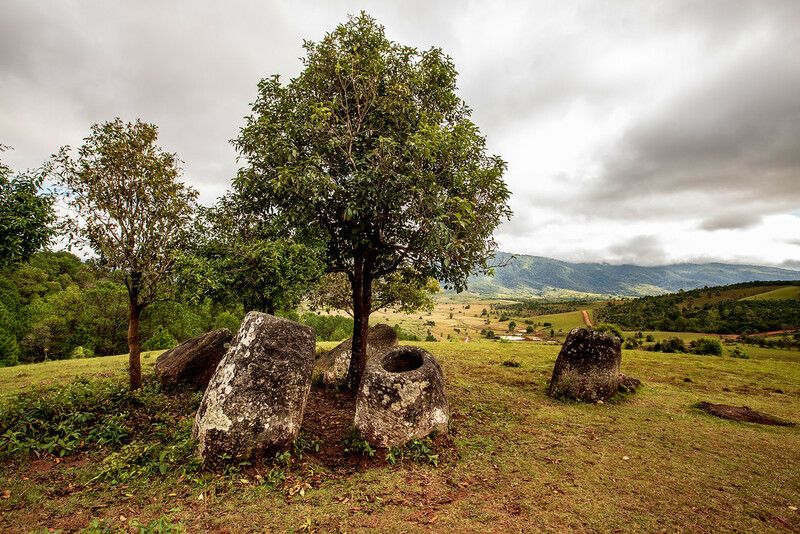 I read about the Plain of Jars once before and still got impressed when reading this article again. The theory of the story behind the stone jars is really interesting. Hope to visit Laos soon and explore this mystery land.